Steelheart is Brandon Sanderson's second new series launch this year, (I still need to read The Rithmatist), and both of those titles are the author's first YA offerings. Being a HUGE fan of his adult high-fantasy series, Mistborn, I was especially curious to read his take on super heros, especially set in a futuristic dystopian world. Needless to say, I've been very eager to start reading Steelheart and upon having finished it, I can safely say that there is nothing better that having your faith in an author rewarded. Yep, this. was. awesome! 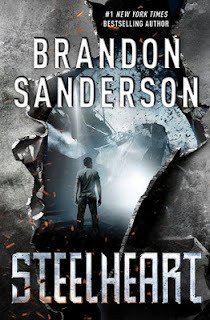 With Steelheart, Sanderson flips the traditional, and often formulaic world of super-heroes completely on it's head and offers up a world where the ones who have super-powers don't become heroes at all. Instead their power seems to corrupt them and leave them with a desire to rule over humanity. When The Epics, as they're called, came into power, it ushered in a terrible period of darkness for humans. Many lives were lost, cities were completely destroyed; still other cities came under the fierce and tyrannical rule of especially powerful and fearsome Epics, like Steelheart. No human stands a chance against an Epic, so no one ever fights back...except a shady underground group of regular humans known as The Reckoners, people who have spent years collecting information on the Epics, and their weaknesses. Right from the start, I was pleased to find that Sanderson's world-building skills aren't limited to traditional high-fantasy worlds. The world in Steelheart something else entirely. It's amazingly well-constructed, especially considering it's about people with super-powers. The premise is solid but also mysterious and ominous. I felt the darkness of this world seeping into every single seen. It never felt safe and I think this added a whole other layer to this already compulsively readable story. The plot sinks it's hooks into you right away, that prologue left me reeling and fully aware that I was in for the ride of my life. Sanderson is never heavy-handed with the descriptions or details, but everything always ends up strikingly vivid and real. It just never ceases to amaze me. The characters are another area I have nothing but praise for. It always feels fresh to read YA literature from a male's perspective. And since I already knew Sanderson was brilliant at writing from female's POV (a.k.a. my beloved Vin from the Mistborn trilogy), it was especially great that Steelheart is told from David's perspective. David is instantly relatable, as well as likeable. He's a nerd with a mission and I can't help but love that! The cast of supporting characters really stood out as well though, each one of them was so unique and endearing. Beyond being incredibly brave and kind of nuts for risking the wrath of the Epics. Speaking of which: the Epics. They scared the crap out of me and I'm not even going to pretend like they didn't. The sheer power some of them exhibited was truly mind-blowing, especially when you consider that none of them were using their power to help anyone. It's like it made their powers seem worse somehow, definitely more threatening anyway. The powers themselves were really cool - I was impressed how varied and original they all seemed to be. I can't wait to learn more about the Epics, and how they got their powers! I guess there are no big surprises from me here: Steelheart was an amazing read through and through! This is a truly stellar start to an incredibly promising series....so...when can I get my hands on book two?! Ooh- this sounds like such an exciting read! I'm glad to hear that the world-building is spot-on; I thought The Rithmatist went into a little too much detail with it, but this book seems to have found the perfect balance. I'm definitely looking forward to reading this! EEEEP, THIS SOUNDS SO GOOD!! Oh, you know I've been wanting to read one of his books since I first heard about him from you! Damn, does he sound talented! And I can see why he would have named them Epics!! Excellent review. You hooked me when you said the world-building in this fantasy novel is different. Definitely something I need to read! Thanks for the great review, Micheline! I know how much you were looking forward to this, since we talked about it endlessly at BEA, and I'm glad it was on point for you. Sadly, I didn't bond with the characters like you did, and was pretty disappointed. The Epics were still really awesome though!